Nestled to the north of Soledad Canyon and to the South of Mint Canyon, sits an impressive quirk of nature: a unique and distinctive geological display created over the course of at least 25 million years. 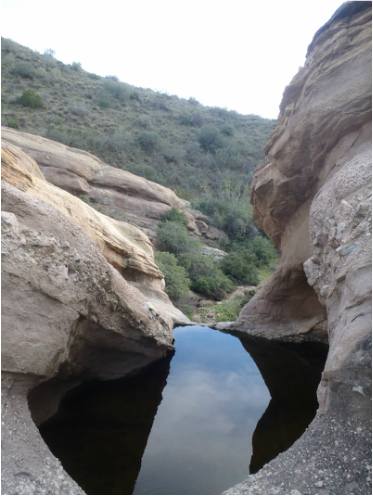 The dramatic, jagged sandstone features, known today as Vasquez Rocks, rise from the ground at angles between 45-52 degrees, pointing to the north like whales peering curiously from the water. These distinctive rocks are part of the Vasquez Formation, which is a thick deposit of sandstone layers created through millions of years of deposits of eroded sand and rocks from the nearby San Gabriel Mountains. After the sand and rock eroded from the mountains, weather and pressure cause the sand to compact and form flat layers of hard sandstone, which in turn are buried by more recently deposited layers which accumulate on the ground surface. Depending on the amount of precipitation each season, some layers are sandier and contain no rocks, while others (known as “conglomerates”) contain inclusions ranging from small pebbles to larger boulders, giving the different the exposed rocks a layered-cake appearance. Due to the Vasquez Formation’s location along the Elkhorn Fault, an offshoot of the more well-known San Andreas Fault, the Rocks are subject to constant movement which has resulted in their extreme lift. 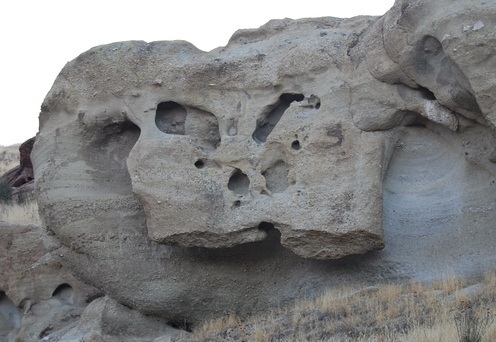 These steep formations erode as they are exposed to the elements, and because the varying layers of the sandstone are composed of alternative soft and hard layers, they erode at different rates. This creates a layered effect of sometimes sharply angled rocks that rise prominently toward the sky. These types of jagged formations are referred to as “hogs back ridges” and are seen in the rocky desert areas such as the canyons of Utah and Arizona, meaning that they were extremely useful to the increasingly popular Western and war genres of film, which increased in popularity from the 1930s through the 1970s. (Please see our History section for more information on filming). For more information on the park's geology, please come visit the park where additional information is available.